We are celebrating the introduction of our new Absolute Steel Hybrid’s arrival onto our website by offering a huge discount to our customers. Check out our website for all of the wonderful details regarding the new Absolute Steel Hybrid stove and the big introductory sale now in progress. 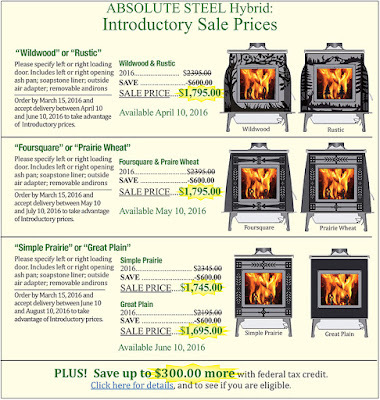 When you place your order for an Absolute Steel Hybrid stove, you could save as much as $600.00!! This is the perfect time for you to get the stove you have always wanted. But don’t wait – these incredible prices will not stick around for very long. When we updated our website to add the information regarding our newest stove, we got so excited, we decided to offer a massive discount on our other hybrid stoves, the Ideal Steel Hybrid and the Progress Hybrid, that are in our current inventory. Check here to see how much you can save. Your savings may be as much as $895.00! We can’t imagine missing out on this opportunity. This is an Absolute Steal of a Deal.